Michael McFadyen's Scuba Diving - SS Annie M. Miller Robert William Miller was born on Monday 27th January 1879 at South Queensferry, West Lothian, Scotland. He was the son of Robert Johnston Miller and Christina (Fraser). Like is father R. W. Miller went to sea in 1893 as a cabin boy on sailing ships. During 1895, he sailed around Cape Horn and before 1900 he had acquired his Master Mariner's Ticket. In 1901 Miller came to Australia and obtained a job with Huddart-Parker Limited as a Second Mate. On 8th February 1910 he married Annie May Kieran at St Marys Cathedral in Sydney. In 1908 Miller left Huddart-Parker and started a marine business venture as a lighterman, transporting goods by loading and unloading ships not at a wharf. To do this he purchased a punt and a second-hand tug. It appears that Robert W. Miller traded under the name R.W. Miller and Company from early 1912. One of Miller's first contracts was to pick up overburden and spoil from the sinking of the Balmain Colliery shaft and dump it at sea. Miller saw the opportunity to sell this material and he ended up getting sixpence a ton from a local council and other contractors for use as road bases and building foundations. Following this close association on Wednesday 15th January 1913 Robert W. Miller was given the contract for coal distribution from Sydney Harbour Colliery Limited (Balmain mine). So begin a long association with coal. Miller built a fleet of lighters that were used to transport blue metal, sand and coal around Sydney Harbour. This introduction into coal transport opened a prospect for him to enter the larger coal shipping transport. During 1917 Miller purchased a vessel, the Audrey D in the name of his wife, Annie May Miller. The ship was used to carry coal from Newcastle to Sydney. This was a tremendous success and in mid-1918 R.W. 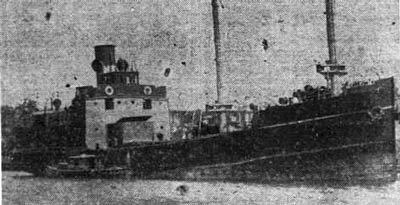 Miller acquired a second vessel, the Douglas Mawson. This was sold the next year and in August 1919 the Meeinderry was purchased from Huddart-Parker Shipping Company. A fourth ship, the Herga was purchased in early 1921. In 1921 R. W. Miller owned 10 punts, 4 ships, 2 hulks and 3 tugs. On Thursday 22 February 1923 Ayrfield Colliery in the Hunter Valley (later to become Ayrfield No. 1) was purchased by Robert W. Miller. R.W. Miller and Company was incorporated in July 1923 and from Thursday 19 July 1923 its offices were at 38A Pitt Street, Sydney. From late 1927 or early 1928 its Head Office was located at 19 Bridge Street, Sydney where it remained for almost 50 years. In 1924 the SS William Macarthur (named after Miller's step-father) built by J. Lewis and Sons of Aberdeen, Scotland arrived in Australia and became R.W. Miller's first carrier for his Newcastle to Melbourne coal run. In early 1924 Miller took over operations of the closed Heddon Greta Colliery. This was legalised on 24 September 1924 and the mine was renamed Ayrfield No 2 Colliery. In mid 1924 Miller had discussed with Christian Franks of the Millfield Mining Company about purchasing the Millfield Mining Company's new mine and coal leases. By October 1924 Miller owned this mine but it appears that it was placed in mothballs soon after till about 1929. In the end, Miller owned over 20 coal mines. During the mid 1920s Miller's output of coal meant that additional ships were needed to transport the coal to Sydney. In 1925 SS Christina Fraser (named after Miller's mother) was built by J. Duthie Torry Steamship Company of Aberdeen, Scotland. 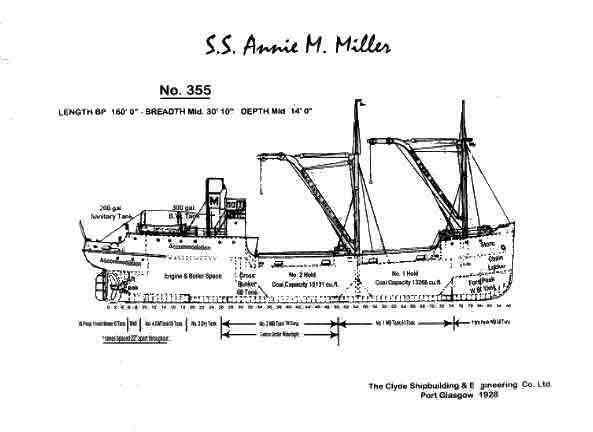 Soon another new ship was needed and the SS Annie M. Miller was built for R. W. Miller and Co in 1928 by the Clyde Shipbuilding and Engineering Company Limited in Port Glasgow, Scotland. As was typical for one of R. W. Miller's ships, the new vessel was named after one of his relatives, in this case, his wife. It was a typical coastal collier, displacing 707 tons with a length of 48 metres and beam of 9 metres (about the same size as the SS Tuggerah but as a wreck it appears to be considerably smaller). The new vessel was powered by a 96 rhp triple expansion steam engine (also built by Clyde), with the steam coming from a single boiler. The SS Annie M Miller left Greenock (Glasgow), Scotland, on 9 August 1928 under the command of Captain A. Williamson. The crew consisted of two officers, three engineers, six sailors, five firemen, a cook and a steward. All the crew were engaged in Scotland and they were planning to remain in Australia once the ship arrived. Shortly after passing Gibraltar after entering the Mediterranean Sea, six sacks of potatoes, six boxes of haddock and a quantity of kippers were found to be bad and had to be thrown overboard. The Miller travelled via Suez Canal into the Red Sea. When she had passed Cape Guardafui (at the entrance to the Gulf of Aden, Somalia), the ship encountered heavy seas and only made 30 miles (48 kilometres) in 14 hours. Captain Williamson turned the ship around and returned to Cape Guardafui. She stayed there for eight days. While there, she ran low on stores. It is not clear if any additional stores were taken on board. After leaving Cape Guardafui the ship encountered intermittent heavy seas across the Indian Ocean and the going was slow. The remainder of the beef went bad and on 3 October 1928 only a bag and a half of flour remained. The biscuits were taken from the lifeboats and the crew placed on short rations. On Tuesday 16 October 1928 the SS Annie M Miller was in dire straits, her bunkers almost empty of coal. It was that bad the stokers were burning a wooden bulkhead to provide steam when the ship put into Bunbury, Western Australia. She took on coal and food supplies and left on the evening of Wednesday 17 October 1928. At 12:15 am on Friday 26 October 1928 the Miller passed Wilsons Promontory in Victoria. She finally arrived in Sydney on Sunday 28 October 1928 after what must have been a hard journey. Although built for use as a collier, she was primarily used to carry blue metal from Shellharbour (Bass Point) to Sydney. In fact, the Miller only carried coal as a cargo three times in her short career, one of which was to be her last voyage. Only six months after being launched and less than three months after taking up service, the SS Annie M. Miller was to sink in tragic circumstances. When the Annie M. Miller entered service, Captain Herbert Pilling, a 45 year veteran, became her master. On 8 February 1929 at 5.30 am, the Annie M. Miller left Sydney for Bulli to take on a load of coal. She arrived just after 9 am and began loading coal. Problems arose and twice she took on a dangerous list, solved only by moving water in and out of the ballast tanks. Finally, all the coal was loaded but the engineers refused to take her to sea until the hatches and tarpaulins were in place. It appears that she was overloaded by about 37 tons. The Captain ordered the hatches to be put on but not the tarpaulins, but it appears that the forward hatches were not put on. The Miller left the wharf some time after 2 pm in a moderate choppy sea. Twenty minutes after departure, the list to port returned. A check showed no water in the bilges. By all accounts, the seas were not too bad and of no real influence on the final outcome. Passing Botany Bay, the list was now so bad that two feet of water was lapping number two hatch. Despite this, Captain Pilling continued towards Sydney rather than take shelter in the Bay. The list got worse until the port railing was underwater. Captain Pilling ordered the lifeboats to be prepared, but due to the list, only the port boat could be launched. At 7.35 pm as she approached the Macquarie Lighthouse near the outer South Head of Sydney Harbour, a rocket flare was fired. It was seen by the lighthouse keeper but not by the nearby signal station which had the only telephone (you would think that in 1929 the lighthouse would have a telephone or, at the very least, a radio). After a 20 minute delay while the lighthouse keeper summoned help, the pilot steamer Captain Cook, left Watsons Bay to assist the Annie M. Miller. The launching of the lifeboat did not succeed as a large wave swept it away. Able Seaman Kenneth McRae leapt in after it and somehow managed to clamber aboard. He rowed back to where he last saw the Annie M. Miller, but she had sank. He immediately found one crew member and after some time, a total of six crew were in the lifeboat. The cook, George Wheatley, later stated that he was worried about sharks while in the water. It is just as well that he was not aware that a fatal shark attack had occurred at Bondi Beach that afternoon. Bondi Beach is only a few kilometres from where the ship sank. The Captain Cook rescued the men in the lifeboat about 30 minutes after the sinking. No trace of the missing six crew members, including Captain Pilling, was ever found. On Tuesday 12 February 1929 the Preliminary Inquiry into the sinking of the SS Annie M. Miller began in Sydney before the Acting Superintendent of Navigation, Captain Sangster. On Friday 22 February 1929 evidence was given that the ship was overloaded and the hatches were not fastened down. On Monday 4 March the Marine Court of Inquiry opened its hearing into the sinking. On 5 March 1929, a Marine Court of Inquiry found that the Annie M. Miller left Bulli with a decided list to port, caused by improper loading and that she was overloaded by 30 tons. The Inquiry also found that the Captain failed to place the tarpaulins on the hatches. The Inquiry stated that while it could not definitely come to a conclusion as to the direct cause of the sinking, its opinion was that the improper loading and the failure to place the tarpaulins led to the ship's loss. On Tuesday 2 April 1929 an Inquest was held before the City Coroner, Mr May, into the deaths of the six men on the ship (see below). He found that they had died by accidental drowning. 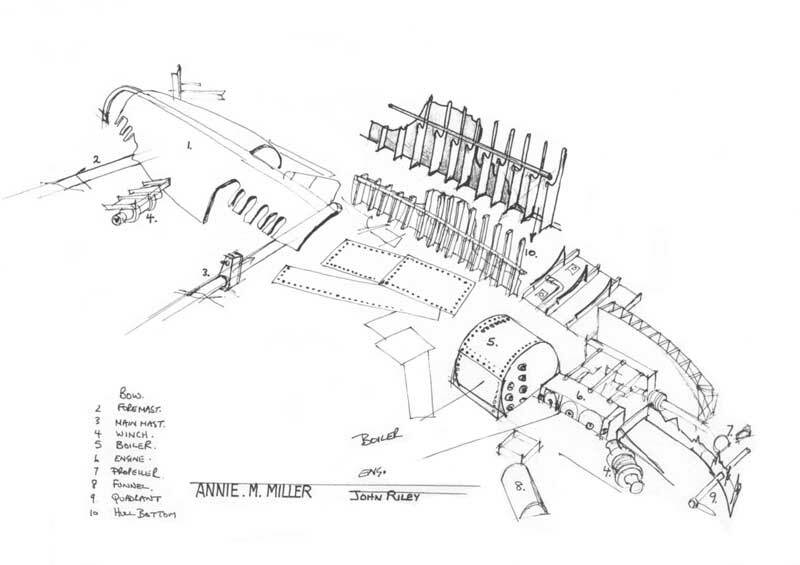 After the loss of the Annie M. Miller, R. W. Miller had a new ship built to replace the Miller, the SS Birchgrove Park. R. W. Miller went on to own Miller's Brewery on Parramatta Road (now the orange Miller's Storage building), famous hotels such as Miller's Brighton and Coogee and the family now owns the huge Miller's Storage company. R. W. Miller died on Monday 10 February 1958 at Lewisham. The wreck of the SS Annie M. Miller was found by Rick Latimer and Peter Harper of South Pacific Divers' Club (so I believe) in 1977. However, I also understand that fishers knew of the location a long time before this discovery. I was told that Rick and Peter were out looking for the wreck when they approached some men fishing and asked them if they knew of any wrecks nearby and were told that they were anchored right over the wreck of the Annie Miller! The wreck is very easy to find using the attached marks. A GPS Reading for the wreck is 33° 52' 06"S 151° 17' 52"E (note that this is right at the southern end of the wreck between boiler and prop). Note that all the GPS Readings on my Web Site are taken using AUS66 as the map datum. If you use another datum you may be about 220 metres off the wreck. See my GPS Page for more details and how to convert readings. Even with GPS, it is still best to use the marks. Run in on the western mark till the north-western mark (the lighthouse) just disappears. The wreck over the boiler comes up a couple of metres but north of this a depth sounder will only show a rise of a metre or less. 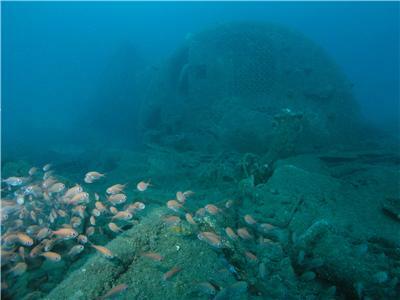 Today the wreck lies in a rough north/south direction at a maximum depth of about 46 metres (average 43). As with most real Sydney shipwrecks, she lies on her port side. The above marks should find you anchored in front of the boiler, although it can be sometimes hard to get the anchor to hook in, especially in southerly or northerly winds. 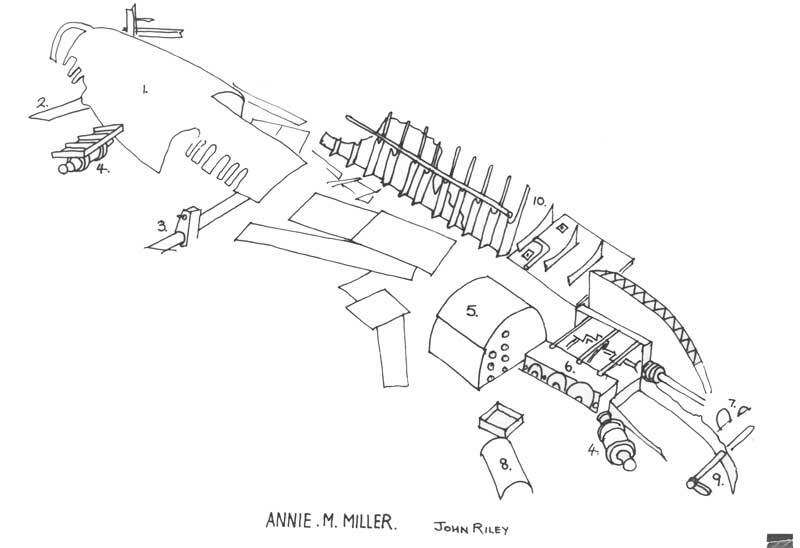 A 3D diagram of the SS Annie M Miller. You can zoom in on various sections, rotate it and do lots more. 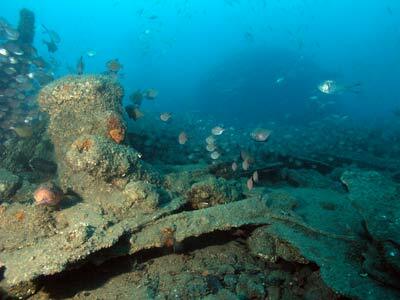 The whole front third of the wreck, including the bow section, has collapsed inwards. The hull is flat and not very interesting at first glance. 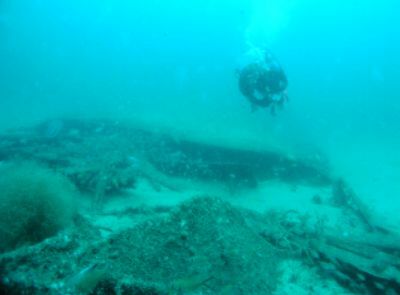 However, swimming forward on the western side of the wreck gives a diver the opportunity to look under the outer starboard side of the hull. 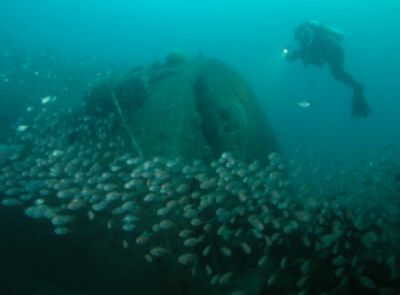 There are often some big fish to see inside this section of the wreck. There is a large mast running out on the sand on this side and further along, right at the bow, another smaller one. At the bow, there is a piece of metal twisted into a crazy loop de loop. This is the top of the hull. There is also a bit of bow off the main section of wreck. After rounding the bow (I have yet to see an anchor), come back down the eastern side (this is the hull bottom) until you reach the broken up section. This area, the middle third section of the hull, has broken into two pieces, the bottom of the hull is still in place (now sitting upright) with the sides broken away. There is a bollard here and it makes a good photograph in good visibility, with the boiler in the background. Heading south from here you will come across the boiler sitting on its port side. This is still very intact. Have a look in and around the boiler before swimming past it on the western side where you will see the funnel lying out on the sand with a winch closer to the engine. There are some other pieces here as well. To your left you will see the large steam engine. This is lying, of course, on its side as well. The bottom of the hull (where the engine originally sat) sticks up a good deal, as high as the top of the boiler. The plates on the hull side are gone, although the hull bottom itself is still there. The side hull plates are totally gone in this area although the main machinery is intact. This whole rear section of the wreck has moved to the east a few metres, separated from the boiler area. The propeller is buried in the sand with only one bit of one blade showing. The rudder is apparently totally under the sand but you can see the tiller (I think this is what it is called). You can examine under the engine at the front of this section. In May 2000 I found some vertebrae in the area of the engine. I knew that they were not human as they appeared to be too large for a man. Later that month I found out what they were. A month or more earlier, a friend of a friend saw a dead dolphin on the wreck. The dolphin had a shark bite out of its body, but whether this was the cause of death, who knows. Anyway, the vertebrae are the dolphin's and as well there is at least the upper jaw of the dolphin there as well. However, on 6 April 2003 I found another vertebrae on the western side of the boiler. This was definitely human. You will now be next to the boiler again and here the hull bottom has collapsed outwards, away from the wreck. This area is often home to very large wobbegong sharks and in a large pipe that runs out east, there is a resident moray eel. Fishlife is very good, in fact sometimes almost as good as the SS Tuggerah and SS Undola and I have sometimes seen tropical fish like short-finned bannerfish here. You also see lots of wobbegongs, Port Jackson sharks (in Autumn), yellowtail, seapike, nannygai and silver sweep. There are also dozens of moray eels, they are all over the place. Visibility is not usually as good as the above two wrecks as it is located closer to shore and it is also near the mouth of Sydney Harbour. Of course, this means that it is also not as prone to southerly currents as the Tuggerah. However, my two dives here in August/September 1998 had very good visibility as did one in May 2000 but in November 2000 we had millions of clear jellyfish obscuring our view. One thing to look for are golf balls. On every dive here I have found at least one. I assume that they are hit into the water from the North Bondi Golf Course a few kilometres to the south and they are then pushed along the sand bottom by currents and swells before being stopped by the wreck. In April 2004 I was attacked by a large cuttlefish which repeatedly attempted to bite me on my left hand/arm. I have no idea why? The next week (1 May) I again dived the wreck and on my ascent I was attacked by about a dozen juvenile Chinaman leatherjackets. 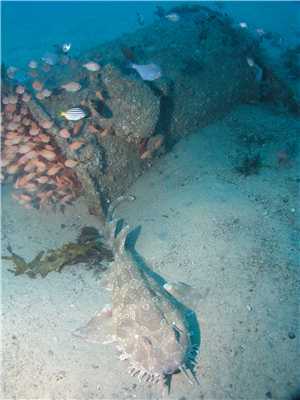 I have seen these fish before when doing decompression on deep Sydney wrecks. On one occasion, they ate the mouthpiece of my oxygen decompression setup. On this day, they tried to bite my hands and while scaring them away, one snuck up behind me and bit my left ear, drawing blood. They then attacked the white anchor rope, biting a loop in it where we attach the anchor after ascending from the wreck. An excellent dive, with one dive enabling a cursory examination of the wreck. 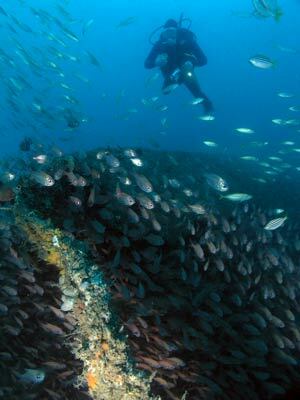 Multiple dives are definitely required to properly see the complete wreck but, of course, this dive is only for experienced deep divers.